If you’re using Safari as your web browser (Apple users, this means you!) 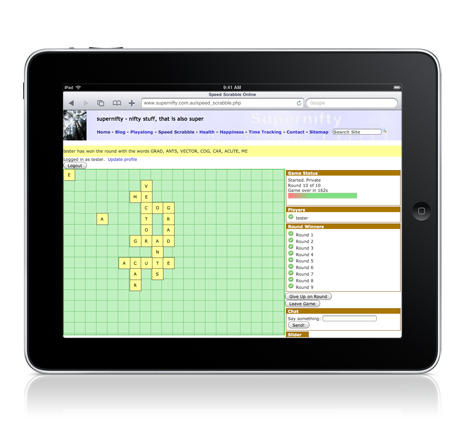 you may be interested in the Speed Scrabble Safari Extension. Speed Scrabble is a fast, fun word game, suitable for single player, but often more fun as multiplayer. This Safari extension enables you to see when there are players waiting to play on the Speed Scrabble server, so you can join them for a game. If you use the extension, remember to play the occasional game – otherwise anyone else waiting for a game through the extension won’t know that you are available! If you’re a Speed Scrabble player, and you use Google Chrome, you may be interested in the Speed Scrabble Chrome Extension. Sometimes it’s difficult to know when your playing partner is going to be online, or how much activity there is at the site, without having to stay on the site all day. This extension solves that by showing at a glance how many players are on the site. If you’d like to try it out, you can install it at the Chrome Extensions Gallery. Just remember that if you’re always watching from Chrome, your friend might be too, so you won’t see each other! Make sure you pop in for the occasional game!